Competitive pressures and unpredictable energy costs continuously motivate us to examine our processes for opportunities to increase quality and productivity, and to decrease costs. Energy-intensive processes such as those associated with the manufacture of a wide variety of products utilizing water or VOC-based solvents offer opportunities to reduce operating costs through heat management or control. Convection ovens coupled to thermal oxidizers are a fixture in many of these manufacturing operations. Both ovens and oxidizers heat, circulate, and exhaust large volumes of air. Without proper design or operation, large amounts of costly, usable energy can be carried out the exhaust stack. For both, the goal of process heat management is to minimize the volume and temperature of the exhaust stream. Heat recovery is the process of utilizing the excess heat that is generated but not consumed by a process. This heat may be directed back to the process as “primary” heat recovery, utilized by a related or connected process as “secondary” recovery, provided to an unrelated process, or utilized for plant make-up air heating. An oxidizer is an air pollution control device that operates by heating a volatile organic compound (VOC) laden airstream to its destruction temperature, converting the solvents to carbon dioxide and water. Typically, the combustion chamber operates in the range of 1400 to 1600 degrees Fahrenheit (760°C to 871°C) to achieve adequate VOC destruction. In a direct thermal oxidizer (Figure 1), a burner fires into the exhaust air stream, heating it to the combustion temperature. The clean, hot air stream is exhausted to atmosphere. In this case, all of the energy put into the heating of the air stream, as well as the heat released in the VOC combustion process, is exhausted out the stack as waste heat. Equipment of this design is suitable for intermittent, low-flow applications where the capital cost of heat recovery is large compared to savings in the operating cost. A recuperative oxidizer (Figure 2) utilizes an air-toair heat exchanger to preheat the incoming air stream. Typical thermal efficiency of a recuperative heat exchanger is 60 percent to 80 percent. 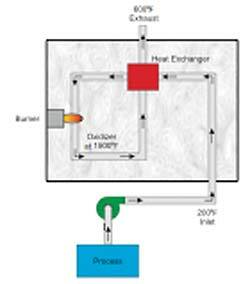 A regenerative oxidizer (Figure 3) utilizes multiple beds of ceramic heat exchange media. One bed absorbs heat from the outgoing air stream while another bed releases heat to the incoming air stream. At regular intervals, a switching valve reverses the airflow through the media beds. The beds cycle between absorbing heat from the process and releasing heat to the process. Typical thermal efficiency of a regenerative heat exchanger is 85 percent to 97 percent. High efficiency heat recovery, combined with the exothermic combustion reaction, creates the opportunity for the oxidizer to operate without the need for additional fuel. In general, the higher the solvent concentration in the air stream, the lower the heat exchanger efficiency or supplemental fuel required to maintain this “selfsustaining” operation. Regenerative oxidizers can reach this operating condition at solvent concentrations as low as 5 percent lower flammability level (LFL). The oxidizer design and process operating conditions will determine how much excess heat is available for secondary heat recovery. Heat recovery can be accomplished in two different ways: Extracting heat from the stack or extracting heat directly from the combustion chamber. Dryer exhaust air temperature, solvent concentration, and heat exchanger efficiency determine the oxidizer stack air temperature. As oxidizer efficiency is increased, the stack temperature will decrease. Destruction efficiency requirements determine the combustion chamber temperature. When concentrations rise above the minimum energy required for self-sustaining operation, excess heat is generated in the combustion chamber. This excess heat presents a great opportunity for heat recovery. Whereas the oxidizer stack temperature will be 100 to 400 degrees Fahrenheit (55 to 222°C) above the inlet temperature, air from the combustion chamber will be at 1400 to 1600 degrees Fahrenheit (760°C to 871°C). Depending on the need, various forms of heat recovery options are available. Direct air heat recovery (Figure 4) is an arrangement in which heated air from the oxidizer is ducted directly to the process. Coupled to a convection dryer, this air can be utilized as preheated make-up air. This system is simple and requires very little auxiliary equipment: modulating dampers, fans and pressure control loops. Direct air recovery does require a large amount of high-temperature ductwork. This system often proves impractical when space is limited, the oxidizer is located a great distance from the dryer, or the product or process will be affected by the partially contaminated air. Heat recovery with an air-to-air heat exchanger (Figure 5) is similar to direct air heat recovery. This system should be considered if products of combustion from the oxidizer may contaminate the drying process or if recovered, energy is used to heat an°Ccupied area. It’s important to carefully analyze the dryer operating conditions whenever considering a blended air heating system. Dryer air temperature is directly related to the volume of makeup air. If air volume and temperature requirements cannot be balanced, an auxiliary heating system, such as a gas-fired burner, may be required to supplement the heat recovery system. Another recovery method is an air-tooil heat exchange (Figure 6). The exhaust air from the oxidizer passes through a heat exchanger, heating a thermal oil. This system offers more operating flexibility for the dryer than the direct air or air-to-air systems. With either of the air-based systems, the oven must take a volume of makeup air that is proportional to the heat requirements of that zone. The more heat required, the more makeup air that zone must take. This is often contrary to the optimum operating condition for the oven. The zones with high evaporation rates, the early zones of the oven, usually operate at lower temperatures than the latter zones that require much lower exhaust rates. The air-to-oil heat exchanger is better suited to these requirements. An oil-to-air heat exchanger located in the recirculating air stream of the dryer allows the air temperature to be controlled independently from the makeup air volume. The hot oil circulation system is more compact, but more complex and expensive than a ductwork system. Air-to-steam heat recovery systems are similar in design and operation to the air-to-oil system. Hot oil systems can operate at higher temperatures than steam. Steam offers higher heat transfer rates. Typically, steam is preferred in a facility already using steam. Otherwise, a hot oil circulation system can be used. It’s important to understand that as the efficiency of the primary heat recovery systems in the oxidizer is increased, the amount of heat available for secondary recovery decreases. A well-designed primary heat recovery system may eliminate the need for any secondary system. The design goal for any new system should be to first optimize the primary heat recovery system. Secondary heat recovery requires the interconnection of two separate operating systems. It’s important to thoroughly analyze the operating cycles of both the process and oxidizer through their entire range of operation. The process provides fuel to the oxidizer; the oxidizer provides heat to the process. If supply and demand are not balanced for all operating conditions, an auxiliary heat source may be required at the process. Generally, it’s not recommended to “overfire” the oxidizer to provide heat to the process. This analysis gets even more complex when considering a tertiary heat recovery system. With primary and secondary recovery, the process requiring the heat operates on the same schedule as the process generating the heat. The tertiary recovery system may be providing plant heating or cooling, or energy to another process unrelated to the converting line. Supply and demand are rarely balanced, so tertiary systems are normally considered supplemental. Designing an efficient heat recovery system is not difficult. Waste heat sources are matched with potential users. The appropriate heat transfer and control system is designed. Determining the feasibility of a heat recovery system is difficult. Heat recovery feasibility is a financial decision. Energy savings must be balanced against capital, operating, and maintenance costs over the life of the system. Accurately quantifying these variables can be extremely difficult. A thorough analysis of potential heat sources and users is necessary. The skill and experience of the system designer is critical. Fluctuating utility prices and changing regulations complicate payback calculations. The science and technology of heat recovery is well-developed. The art lies in the application. So where do you start an investigation to determine if your existing or proposed new system(s) are energy-efficient? The investigation on existing equipment will require a technical person skilled in measuring or obtaining the pertinent data related to the equipment evaluation. With new equipment, it should be readily available in the proposal or obtained during technical reviews of the planned project. 1. Define the process line’s heat load distribution – where is the energy going? 2. How much variation exists in the solvent rate input for the product range produced? Factor in the amount of production run time on each product, e.g., a low solvent input rate may be a high percentage of your production. The line sizing and your process exhaust are likely based on the higher input rate product(s) produced. 3. 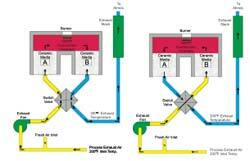 Generate an accurate flow diagram for the process line being evaluated! Record the entire product input and output conditions that define your process. Obtain all the associated flow, temperature, pressure, installed and operating horsepower, etc. versus the product input data. This data-gathering process can expend a great deal of time and energy but is essential to getting results. 4. What are the payback opportunities available related to this discussion? Some companies have the necessary skills and manpower within their organizations to evaluate and implement energy-savings programs. If not, another option to determine if your process has opportunities to save energy is to contact a consulting engineering firm or capital equipment manufacturing company. Many of these companies offer energy and engineering services to assist you in evaluating your process. Today, energy costs encompass a significant percent of your total rising production costs. Accept the challenge, dig in and do the analysis and implementation work – you and your market will both benefit. 5. Check with local, state and federal agencies. Oftentimes, funding tax benefits or low-cost loans are available for projects with proven energy reduction.